Dietrich Buxtehude (or Dieterich according to Danish spelling) (born about 1637; died May 9, 1707) was a German (or Danish) composer and organist. He is one of the most important composers of the mid-Baroque period. He is best known for his organ works which are very often heard at recitals and church services. He also wrote a lot of excellent choral music and music for instruments, including the viola da gamba, an instrument which he played. He had a very important influence on Johann Sebastian Bach. When Bach was a very young man he walked over 200 miles to hear Buxtehude play the organ. 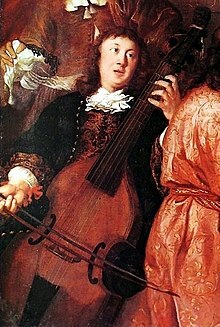 Very little is known of Buxtehude’s earliest years. We cannot be sure where he was born. His family came from the town of Buxtehude in North Germany but had moved to Oldesloe which is now in Germany but at that time it was part of Denmark. His father was organist in Oldesloe, but around the time of Dietrich’s birth the family moved to Helsingborg which is now called Hälsingborg and is in Sweden, but at that time Helsingborg, too, was part of Denmark. In 1641 the family moved to Helsingør which was just across the water, in Denmark. Dietrich Buxtehude probably went to school in Helsingør and learned music from his father. When he was 20 he got his first job at Helsingborg in the Marienkirche (St Mary’s Church) where his father had been organist some years before. Sweden and Denmark were at war at the time, fighting about which country Helsingborg should be in. This must have made things rather difficult for the young Buxtehude. The people who went to the Marienkirche were German-speaking. In 1668 Buxtehude got the job of organist at the Marienkirche in Lübeck in Germany. This was a very important job at one of the biggest churches in Germany. The organist before him had been a man called Franz Tunder. He had a daughter, Anna Margarethe, and Buxtehude married her. His job was not only to play the organ, but also to tune it and do a lot of administration in the church. He composed many cantatas for the services and organized five evening musical performances every year. These concerts were called “Abendmusik” (“Evening Music”) and were held at 4.00pm after the Evening Service. Unfortunately we do not know what music was performed at these concerts. Buxtehude stayed in this job for the rest of his life. He never travelled very far. Nicolaus Bruhns was one of his pupils, and Pachelbel wrote a piece of music called Hexachordum Apollonis for him. In 1706, when Johann Sebastian Bach was 21, he got permission for four weeks holiday so that he could go to Lübeck to hear Buxtehude play. He stayed in Lübeck for four months and so he got into trouble when he went back to his job at Arnstadt. In 1707 Buxtehude wanted to retire. Whoever took his job would have to marry Buxtehude’s daughter, Anna. Bach and Mattheson were interested in the job but decided not to take it. Probably they did not want to marry Anna Buxtehude. Buxtehude died, and the man who had been his assistant got the job and married Anna shortly afterwards. The organs that Buxtehude played were very large instruments with bright sounds (bright mixtures, reeds and a “Zimbalstern” which was a star which went round and round, making a tinkling sound). His music is very grand and impressive. Many of his organ pieces have several sections, each one at a different speed. They often sound like a free improvisation. Some of the sections are fugues. At least 128 vocal works survive, they are nearly all church music. He wrote instrumental works, chamber music and pieces for harpsichord. This page was last changed on 12 September 2016, at 23:31.